Thirteen years after the release of “Invincible” and 43 years since Vince Papale’s Philadelphia Eagle’s debut, Vince Papale Jr. is getting his own Eagles tryout. The son of the Eagles legend will participate in a local pro day with the Eagles on April 17, according to Eagles Wire’s Andrew DiCecco. 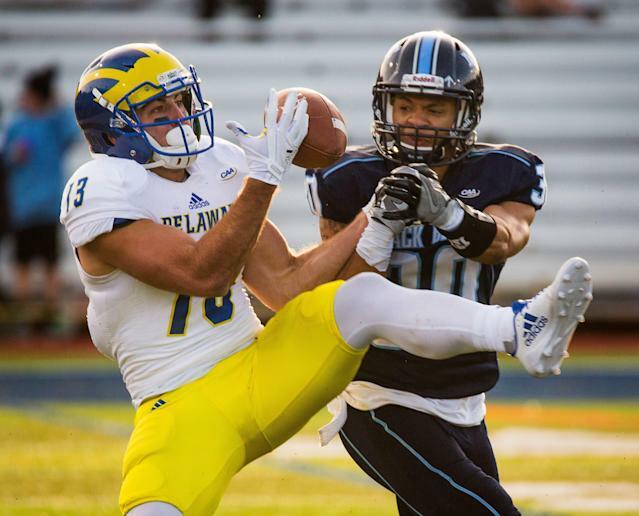 Spoke to Delaware WR Vinny Papale at the conclusion of pro day. Said he’ll be participating in the #Eagles local pro day on April 17. The younger Papale just finished his college career as a wide receiver and punt returner with Delaware, where he recorded 19 receptions and 248 career receiving yards. While that production is obviously modest as far as potential NFL players go, they’re definitely better than his father’s. The elder Papale famously made his NFL debut at the age of 30 in 1976 with no college football experience, earning a spot on the team through a tryout. Papale would go on to become a special teams standout with the Eagles and eventually have his story immortalized in Disney’s “Invincible,” released in 2006 and starring Mark Wahlberg as Papale.